when I fill a form it is not creating automatically new contacts in my google accont linked in the settings of the integration. Can you please try using the integration within the form builder. I made a test of the integration on my jotform, but so far it was working. Hope this help. Please tell us if the issue persist. 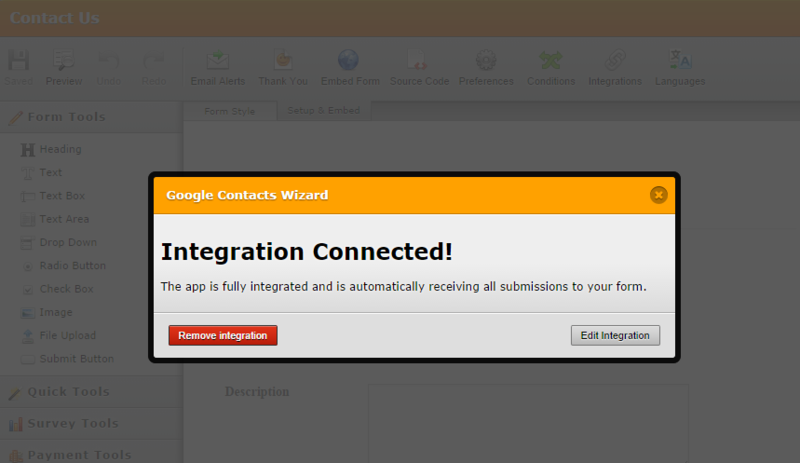 I Removed from the app page and used the integration within the form builder it says again "Integration connected! The app is fully integrated..." I checked also in the app page it seems to be automatically integrated...but still NOT WORKING. I do a new sumbission to the form and the folder that I've choosen to send to, is empty. 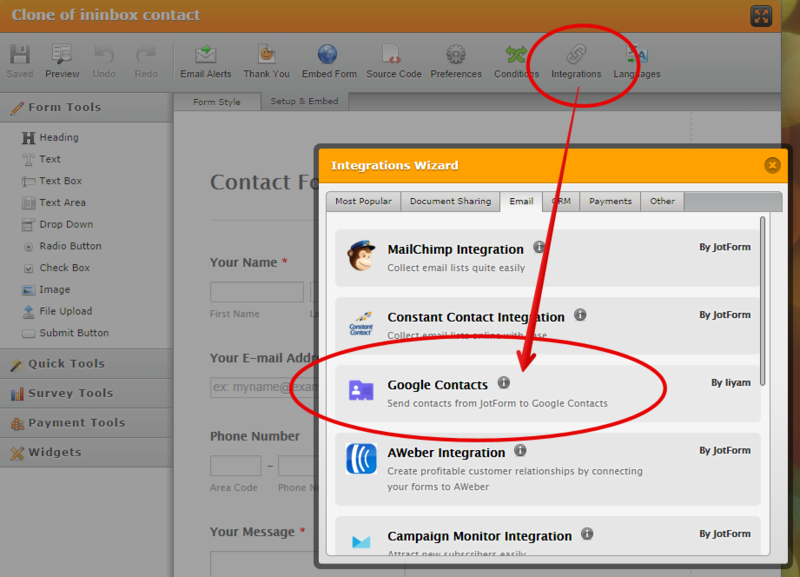 You can create a new Folder in your Google Contact specifically for the jotform integration. This way, the integration will add the new Contact from jotform into that specific folder where you can easily check if contact is being added. In my screenshot of my Google Contact, you can see my folder named "JotFormContacts"
I just need to see how it looks on your end, perhaps I will be able to determine a reason why it doesn't work on your end. I noticed that in the app page I cant click on Remove from that form that I selected but only on other added after. And also sometimes I get this error trying to connect the integration "error creating web hooks"
I'm currently having the exact same issue. Seemed to work fine a couple of days ago, now not working. I played with it a bit, and now it seems to be working. It seems that if your mess around to much with adding additional phone numbers or email addresses Google contacts doesn't like it. There must be some object in this jotform that could be causing the problem. I haven't able to figured it out yet. But can you please at least try first integrating a different jotform? Try using a basic jotform (with full name, address, email) and then integrate it to Google Contacts. Let us see if this test will result to similar issue or it will work. 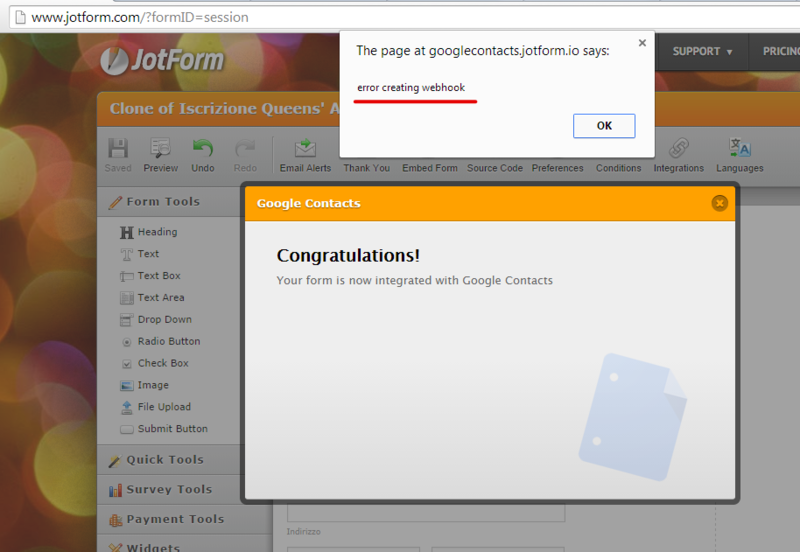 I will investigate further why this jotform http://www.jotformeu.com/form/42467203154348 is having error when integrating to Google Contacts. Perhaps if I am able to determine the cause of error, we can fix it. Please update me of the result of your test on a different form. It doesn't work on my end either. I think the integration is broken. It creates a new group in contacts but when you integrate it doesn't proceed. I just see "error creating webhook". 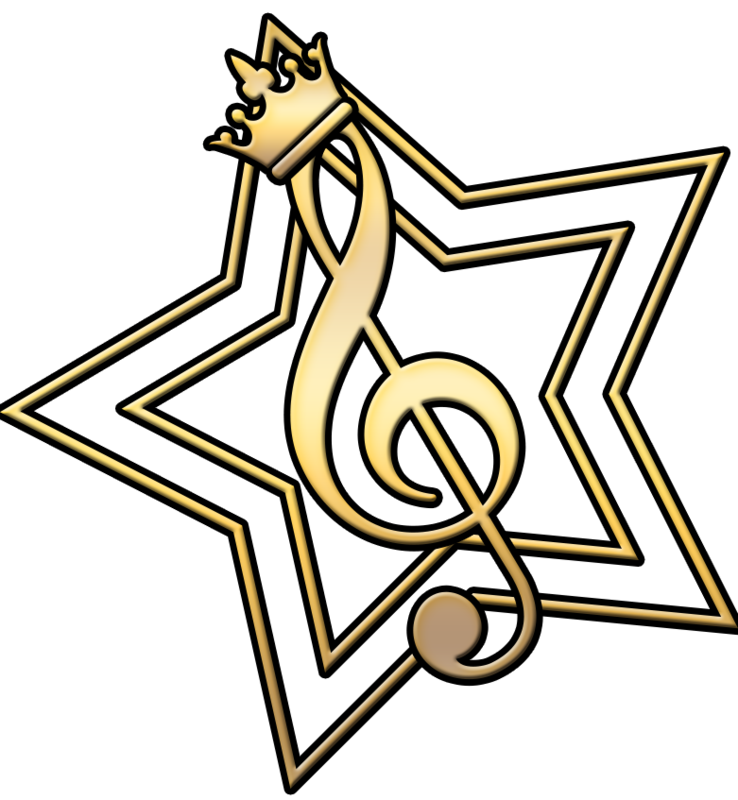 If you are also using QueensAcademy there was already an opened ticket here http://www.jotform.com/answers/434725. I Removed and Connected again many times and I discovered that the problem is in the fields added in the integration wizard. If I put the Address label after the name as automatically in the Integration wizard, it is not sending any contact to my gmail account. 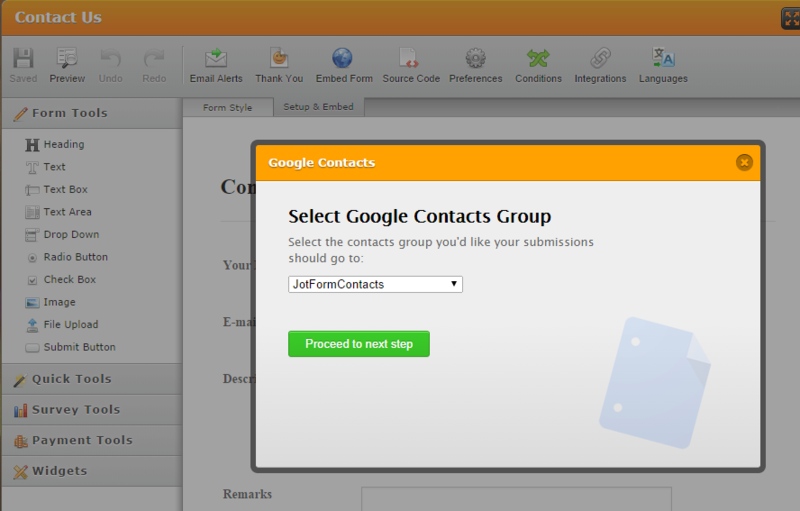 FINALLY I GET SOMETHING IN GOOGLE CONTACTS! I got in contacts JUST the submissions that have the Phone Home, and the Mobile in Contacts is connected as "Work". And so on with many others test that I've done. It is sending just one, maximum 2 fields. Not Always, and often not in the correct way. So maybe this is the problem that should be fixed, in the code of the integration. No luck for me. I can't make the form connect to my google contacts. 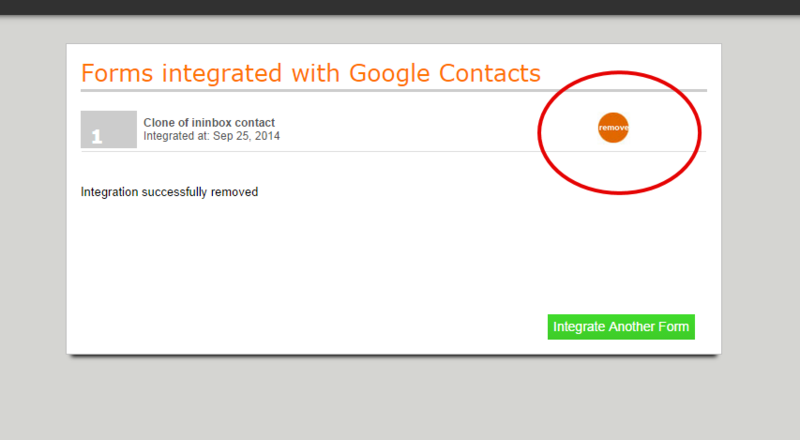 There is really somethings wrong with google contact integration. I already used basic fields and none of them connects. I'm still getting the error. Let me forward a ticket to our 2nd level so they check what's causing this. I've made fixes a couple of hours ago with the Google Contacts integration. Can you please try again if the problem persists?